Bring your family to the amusement park Tivoli and enjoy the fun rides! Have a pleasant stay at one of our Scandic Hotels in Copenhagen. Tivoli in Copenhagen is fun for everyone! Activities for the kids, get dizzy in the roller coaster and treat your loved one to cotton candy. Stay at one of our comfortable Scandic hotels in Copenhagen and enjoy a great day at the amusement park, feel young at heart. The offer can be booked only during Tivolis opening dates. Use the booking code TIV when making your reservation online. The offer is valid at Scandic Sluseholmen, Scandic Kødbyen, Scandic Sydhavnen, Scandic Palace Hotel, Scandic Webers, Scandic Front, Scandic Copenhagen in Copenhagen. 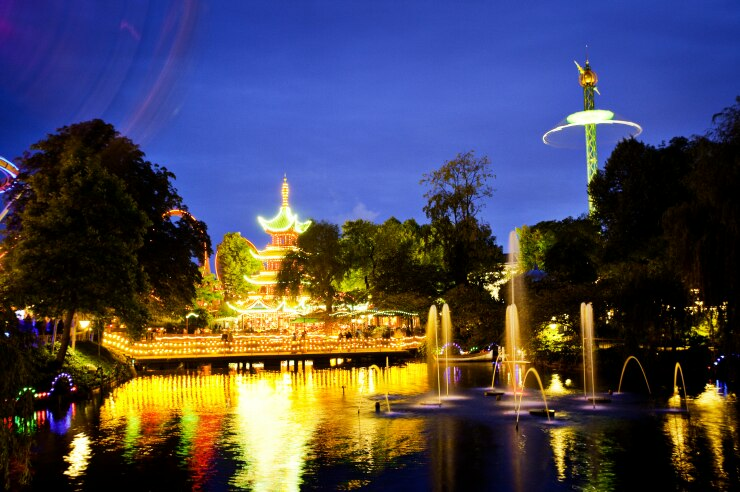 The offer is valid all days during the opening period of Tivoli Garden in Copenhagen. This package can only be booked online and is subject to availability and to a limited number of rooms. You may change or cancel the booking until 18:00 local time on the day of arrival. Pay in conjunction with your stay. Admission to Tivoli Garden for 2 persons are included in the rate. The offer cannot be combined with other offers or discounts. Breakfast and VAT are included. The combined travel services you are being offered are part of a package trip according to the definition in directive (EU) 2015/2302. Read more information about central rights according to directive (EU) 2015/2302.